I started laughing this morning when I entered the space where I’d soon be presenting to the Legal Marketers Association. There at the head of the room was a pulled down screen and next to it someone setting up the extensions and power cords for a power point projector. One of the association representatives quickly jumped in to assist with where to align the small projector table just as I sidled up to share, “I won’t be using power point today.” Both the facility manager and the association representative did a double-take. Nope, there’s only one time I have used power point to enhance my presentation, and it wasn’t worth it. At the time I used only visual images to support the points I was making. Since then I’ve realized so many other applications can create a more engaging effect for my topics on communication. For instance, using volunteers to demonstrate the communication basics (message, delivery, connection, projection and attitude). Without fail there is such high engagement from the audience when volunteers are included that it is always worth the time to await the 5 volunteers I ask for. In adult learning, 1/3 of our cues come from those around us. So we can either whisper back and forth or be encouraged by the presenter to share. The third 1/3 of information useful to audiences comes from the presenter. If I have an hour to present a topic of information, I aim for 20 minutes of timed content. Beyond that is a string of questions seeking feedback, probing for more clarification and comparing to what the audience has already experienced. I know to infuse activity to deepen the learning, taking the content from head to gut. 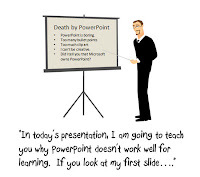 When my presentations use all three approaches, there is such heightened focus and prolonged post-presentation conversation with me and others in the room that I have vowed to never waste time with power point. The best images I can create are in the nonverbal responses within the room. That’s worth much more time than power point. The name of the game is connecting, and the method isn’t technical. It’s now power speak, power reflect, power experience and power results.